It is the start of the new year and out of the blue I have received something rather amazing. Thanks so much to Maria of Life's Sweets and Spices for giving me such a prestigious award to start my year. I am so grateful and honored. Now just because I am in such a very perky and happy mood today (though am always in a cheerful mood hehehe) I would like to share this award to the people that have shown outstanding talent, skills, and of course friendship. To all of you that I have awarded I would like to say thank you so much for everything that you have taught me and more importantly for the friendship and care that you all have shared and may the new year bring us all good tidings and blessings. I am forever grateful to have met all of you and hope to continue with you all around. Metz!!! I am truly honoured! Thank you so much from the bottom of my heart! Yihaa I love awards... congrats to you and the others too for receiving them.. Muahss!! thanks for the award. I am a very happy man today. Thanks for updating my image as well. Wow! Thanks so much Metz! It's my honor to get reward from you! I am so glad to meet you in Blog World, And learn much from you too! hi metz! 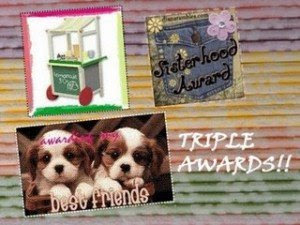 congratulations and thanks for posting :D i'm glad you liked the awards. Hey Metz! I'm back! Hehe. Been away for a few days I missed my blog and of course my friends - and guess what your comment was one of the reasons why blogging is fun. Thanks for the award and the linky lovin. Hi Metz! Thanks for the special mention and the award as well. I am giving it back to you coz you deserve it too! Have a happy weekend friend! Metz thank you for the great award..I'm really love it!!! I have posted your awards. Thanks for those great awards.